Does government debt impose a burden on future generations? A relevant question given the high current government debt levels to which most people will answer with a clear "yes": we are spending today and passing the bill to the next generation. But this answer is incorrect (or to be more precise it might be incorrect). The link between debt and burden on future generations is much more complex than what many think. The debate becomes even more complex as the issue of desirability of another round of fiscal stimulus is mixed with the notion of intergeneration transfers associated to increasing government debt. Unfortunately, economists tend to go in circles and debate the same subjects over and over again without reaching consensus, so when I went back a few months (January this year) I found a very similar debate with practically identical arguments being put forward by both sides. The lack of consensus in this particular debate is much more about semantics that about disagreements on how the economy works. My reading of the debate is summarized well by Noah Smith long list of updates to his blog entry. In particular the following question: is government debt an indicator of the (fiscal) burden we are imposing on the next generations? And the answer is a clear no. Debt does not matter. What matters is taxes and spending, debt is just a vehicle to deal with imbalances between the two. Debt is not a burden per se but it can be the outcome of tax and spending decisions that lead to redistribution of resources. We can construct examples where a government with high debt levels is not imposing any costs on future generations. We can also construct examples where a government with very little of no debt imposes large burden on a given generation (tax everyone under 50 and give the revenues as a transfer to everyone over 50). And while seeing these debates come back without a resolution is frustrating, the advantage is that I can cut and paste below a longer and more detailed post that I wrote last time the debate happened. Just for those who still want to read more about it. (Repost) Debt does not matter. Spending and taxes do. Paul Krugman makes the point that government debt matters less than most people think because in some cases we simply owe money to ourselves. He is right and what he has in mind is the notion that government debt is (in many countries) mostly held domestically. Japan is an extreme case where more than 90% of the government debt is held by its nationals but even in the US the majority of government debt is held by US citizens or institutions. For some it is debt but for others it is an asset, they cancel out from a national point of view. We can think of an extreme case where government bonds are held by all taxpayers in proportion to their income - in a way that mimics tax rates. In that case, government debt is not imposing a future burden on anyone, it simply cancels out with the assets that all investors/taxpayers have. How do future generations enter into this analysis? What if we try to pass the bill to future generations? Let's start with the case of a closed economy/system. In a closed system (the world, no international trade or capital flows) the debt that the current generation has will end up in the hands of the future generation in one of two ways: either it gets simply passed to the next generation as a bequest or, alternatively, the current generation could try to sell their assets and spend all their wealth if they do not want to leave a bequest to their children. But the debt must be bought by someone. And given that this is a closed economy, it can only be bought by the future generations. In both cases the bond holders are also the taxpayers. If we bring other countries into the picture then the analysis is different. The government debt that other countries hold is a claim on our current and future income and as such it is a financial burden that either the current generation or the future one will have to pay for. But Krugman's point, which is correct, is that many make the mistake of assuming that government debt is equivalent to external debt and they overestimate the burden that it imposes on a country. Let's go back to the case of a closed economy: is it really true that debt does not matter? Not quite, because there are distributional issues of two types: first there is no perfect match between bond holders and taxpayers so it is not quite true that we owe money to ourselves. Some citizens owe money to others. The second distributional issue is about generations and here we need to go back to the example above to understand how difficult the analysis can get. The best way to understand the argument is to stop talking about debt and talk about spending and taxes, which is what really matters. A government spends some income today (builds a road, provides health services to the population). It decides not to tax anyone but instead it issues debt bought by the current generation. The government decides that it will only pay back the debt in the future when it raise taxes on the next generation, not the current one. Are we passing a burden to the next generation? It all depends on what the current generation does. If they decide to spend all their income and leave no bequests for their children then the answer is a clear yes. The current generation enjoyed services that they did not pay for themselves and did not compensate the next generation in any way for the future taxes they will have to pay. Just to be clear, the future generation will be holding the debt that the previous generation sold to them when they were spending their inheritance, but this is not a transfer of resources, the asset was sold at market price. So the fact that in the future bondholders are also the taxpayers does not mean that we are not passing a burden to the next generation. There is a second scenario where there is no burden passed to the next generation. It can be that the current generation is responsible, understands that the government is asking future generations to pay for the goods and services that they enjoyed and they decide to leave a larger-than-planned bequest to their children so that they have resources to pay for all the taxes (you can think about the bequest being the government debt itself). In this case no burden is passed to the next generation. This simple example (*) makes it clear that answering the question of what distributional impact government debt has across generations requires an understanding of the patterns of spending, taxes and saving of different generations. What matters is not debt but who enjoys the spending that the government does and who pays for it. Debt is just a vehicle that can be used to transfer resources across different individuals or generations. Debt is not a problem, the problem, from a generational point of view, is the potential mismatch between spending and taxes (even if future taxpayers are also the holders of government bonds when they are paid back). The new issue of the IMF fiscal policy monitor is out. 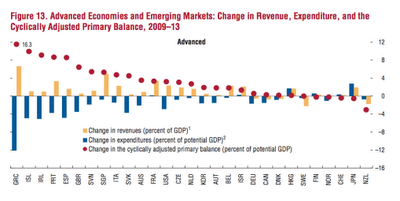 As usual, a great reading to understand the state of fiscal policy in the world. There are many issues I could highlight from the report but here is one that caught my attention: below is a summary of what fiscal policy has been doing since 2009. The red dot in the chart represents the change in the cyclically-adjusted primary balance as a % of potential GDP in advanced economies during the period 2009-13. This variable is the best way to capture discretionary fiscal policy, as the balance is adjusted by the cycle and we use potential output (instead of output) to avoid the ratio to be influenced by cyclical variations in GDP (the blue and yellow columns just show how much of the action comes from expenditure cuts of increases in taxes). Not only we see a majority of countries reducing budget balances (a coordinated fiscal policy contraction) but the numbers are extremely large. Greece is an outlier (16.3%), but many others are large (Spain, Portugal and Ireland close to 10%), the UK around 7% and a significant number of countries around 4%. How this coordinated fiscal policy contraction is affecting the pace of the recovery (or the likelihood of another recession) depends on your views on the fiscal policy multipliers (see my previous post), but what remains a fact is that the amount of coordinated fiscal policy contraction during the current cycle is very large and I doubt that we can find a similar experience in any of the previous recoveries. And the answer is yes and here is my reading of what has happened. About eleven years ago there was a series of academic papers that estimated fiscal policy multipliers. The conclusion of the earlier papers is that multipliers were somewhere in the range 1-1.5. In other words, a 1% increase in government spending raised GDP by somewhere between 1% and 1.5%. This was the conclusion I reached together with my co-author back in 2001 (paper is available at my web site). This was also the conclusion of the paper written by Oliver Blanchard and Roberto Perotti written around the same time and available here. The academic literature on this issue grew very fast with a large number of papers confirming the earlier estimates but also with a set of other papers that challenge the size of fiscal multipliers. In particular, papers that used events such as wars tended to find smaller multipliers. Because this is about fiscal policy, the debate has not gone away and there are still those who believe that multipliers are close to zero or even negative (i.e. when public spending goes up, private spending goes down by the same amount). Despite the debate, my reading of the literature up to that point was that there was a significant amount of consensus around multipliers being around or slightly above 1. As soon as the 2008 crisis started the debate went from a simple academic discussion to an urgent policy issue. What will be the impact of fiscal stimulus? The Obama administration produced a report (co-authored by Christina Romer) that suggested multipliers around 1.5 to justify the need for fiscal policy stimulus. These multipliers were criticized by those who believed that there is no room for aggregate demand management even in the presence of a large crisis. Since then the debate has become much more ideological than academic. We have had a series of additional academic papers that, if any, suggest that multipliers are even larger than the initial estimates because of the special circumstances we are in (monetary policy stuck at the zero-lower bound and a deep recession caused by develeraging forces that reduce private demand). But these new (and old) academic results have simply be displaced by the ideological debate that followed the fiscal policy stimulus of the 2008-2009 period, which somehow led to the conclusion that those policies did not work and that what we now needed was more austerity. And when over the last two years we forecasted GDP growth rates in the face of coordinated austerity by many governments we somehow forgot to consider that multipliers can be large. This is what the IMF suggests now in their analysis, which, by the way, is also self critical. They look at their recent forecasts for global growth and they suggest that their model was implicitly using fiscal policy multipliers around 0.5 when measuring the impact of fiscal consolidation. Given that their GDP growth forecast has been overestimating growth, the IMF now wonders whether multipliers are higher than 0.5. The analysis in the current World Economic Outlook suggests that multipliers might be within the range 0.9 to 1.7. A range which happens to be very almost identical to the one produced by the early papers and confirmed by the most recent academic literature. It is also not far from what most economic models would predict given current economic conditions. Stephen Roach argues in this article that the "current medicine being applied to America's economy" is wrong. The real disease is a "protracted balance-sheet recession that has turned a generation of America’s consumers into zombies – the economic walking dead. Think Japan, and its corporate zombies of the 1990’s. Just as they wrote the script for the first of Japan’s lost decades, their counterparts are now doing the same for the US economy". This is an argument that has been used before during the current crisis: we are trying to fix a structural problem with medicine that can only deal with cyclical misalignments. Using Roach's words: "Steeped in denial, the Federal Reserve is treating the disease as a cyclical problem – deploying the full force of monetary accommodation to compensate for what it believes to be a temporary shortfall in aggregate demand." There is no doubt that asset bubbles and excessive optimism during the pre-crisis years are now reflected in weak balance sheets that will take time to fix and will represent a drag on growth. And this clearly is not a mere cyclical issue. But there is something else that is going on: advanced economies have gone through a deep recession and are still producing below potential. This is not structural, this is cyclical. And finding a solution to the structural problem in the middle of a recession is not easy. While households have to reduce spending to repair their balance sheets, doing so at the same time that income is below potential just becomes more painful. Monetary and fiscal policy cannot eliminate the effort that is associated with deleveraging but they need to ensure that this happens in the least painful way. And this requires producing a path for output and income in the short run that is as close as possible to the level of potential output. We can debate about what this level should be but it is hard to argue that given current economic conditions and high levels of unemployment we are close to potential.